Flow indicators with an electrical contact output at a specific flow rate with switch output. Applications include chemical processing, waste water processing, lubrication systems, drain lines, process control, and pump testing. 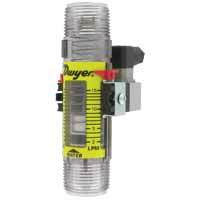 Flowmeter with Flow Limit Switch offers visual flow rate indication and an adjustable flow alarm. A few applications include chemical processing, pump testing, process control, solar systems, and drain lines. In-Line Flow Alarms provide continuous monitoring and control of flow rate levels. Applications include waste water processing, lubrication systems, process control, solar systems, drain lines, and pump testing.